Since Dakota and I have relocated to the territories, there’s a good chance that we’re going to lose most of those who dared this year. Sorry about that. Things just went all haywire with Blogger and we couldn’t see any other alternative but to leave town. But leaving town for the territories is an old American tradition, for Westerners at least. My paternal grandfather was always on the move, town to town, state to state, through the West, looking for the next big thing. So, I’m hoping this move will work out, and that everyone who signed up for the TBR Triple Dog Dare finds our new location. And that they’re all having a good time with it. Thomas at My Porch had a wonderful review of Graham Greene’s The Human Factor which really had me wanting to read more Greene, who is a longtime favorite of mine. So I checked the TBR bookcase, which is two books deep on some shelves, and found a copy of The Human Factor itself! So, when I finish the first part of Our Mutual Friend…. I’m doing the Deal Me In Short Story Challenge, but using just the anthologies I already own. So, I’ve been really good about the TBR Triple Dog Dare this year. As far as the move to WordPress goes, I’m really enjoying it. My reading audience here is about what is had become over at Blogger, 15 visits a day, but it’s already growing. I’m trying to get the word out about the move, so my commenting on other blogs is up. It’s been nice to go back to reading what everyone else it writing more. I’d slipped quite a bit this past year. Staring over, learning the new system here at WordPress, rebuilding my readership, etc. has really turned out to be fun. I’m excited about blogging again. To be honest, I was just about ready to throw in the towel and give it all up, when Blogger went all wonky on me forcing me to start over. Now I can see staying around for quite a few more years. 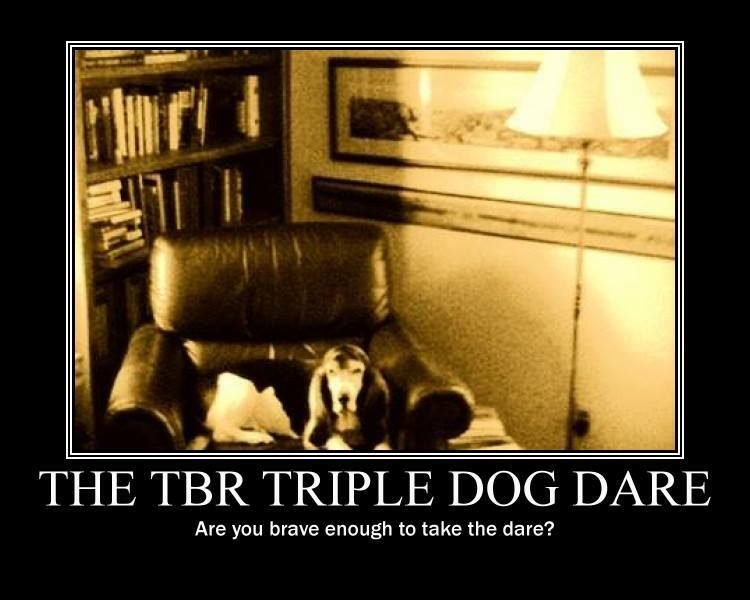 But this wast meant to be a TBR Triple Dog Dare check in post, since we’ve finished the first month of the event. If you’re a participant, please consider leaving a comment to let us all know how you are doing. If you’ve strayed or given up, please don’t feel at all embarrassed about it. It’s all in fun. I kind of like seeing who sticks it out until the very end, myself. I read five books from my TBR pile in January – 1 from the actual shelf, 3 virtual (on my kindle), and 1 audio. My goal is to tip the ratio in favor of physical books this month! I haven’t done a count, but I think I come in at seven or so books for January. It’s honestly always been fun to see what’s on my own shelves for at least the first month. I’m glad the relocation went smoothly overall, and it’s exciting to hear that it has re-energized you. I think being on Twitter has helped people find you – and new ones discover you, obviously. I’m keeping an eye on blogger, in case (when) it goes wonky on me as well. I survived the first month! though I bought nearly as many books as I cleared off, thus defeating one of the main purposes. I will do better in February. But at least I haven’t read any of the new ones, even the sequel that is going to torment me until midnight on March 31st. I have some Wilkie Collins on the TBR shelves, but I’ve been having trouble settling in to a long Victorian novel – I’m just managing some of Trollope’s short stories. I think it was funny that I had those books on my TBR shelves. I really do have far to much on my TBR shelves. When this is all over, there is going to a great cull of that particular case. If it’s been on the shelf for more than five years un-read, then it’s just never going to get read and should move along to someone who might really read it. Twitter has turned out to be lots of fun. I wish I hadn’t been such a snob about it for so long. So far so good on the TBR Dare. I read seven books in all, although I haven’t made a dent in my TBR bookcase because so much of my reading was for book groups and group reads. And then I decided to read No Name, which took a while and was on my e-reader, rather than my physical shelves. I want to focus more on my physical TBR in February and March. I’m going to have to sit down and do a serious count and see just how many books I have read so far. I’m just guessing seven at this point. There are a couple of new titles I really want to buy, to my shelf if probably going to end up the same as it was in Dec. this year. I’m curious: so far I haven’t had major trouble with Blogger, but I see many bloggers move to WP, and wonder what happened (and whether it will happen to me). I don’t seek followers to my blog, just keep track of reading challenges. Over the years I’ve seen quite a few people move on to WordPress. So far, I like it better than Blogger. I still have no idea what happened to Ready When You Are, C.B. but it was lots of fun while it lasted. I like your idea of culling books you’ve had on the shelf for more than five years un-read – I might try that too. If you’re not having fun with it, I say give in and get some new books. I prefer people keep to the dare as long as they are having fun with it. It’s king of interesting to see just how long one can go reading only books from the TBR shelf, though. See how well you do this year, maybe do it again next year.. I know I said this would be the last year, but since I’ve started this new blog and gotten all excited about blogging again, you never know…. Firstly – welcome to WordPress, James! I’ve done OK on the TBR dare too so far, but will probably have to give in at the end of Feb as a new project is on the horizon which will mean reading new books. I do love the TBR dare though – and have read some books that I’ve had for ages in January. Completing two out of three months is quite good. It’s always been fun to finally get around to those books that have been on the shelf for ages. Not only have I not bought any new books, I haven’t bought any new red lipsticks, either. And it’s February! Talk about withdrawal, but of a very healthy sort.